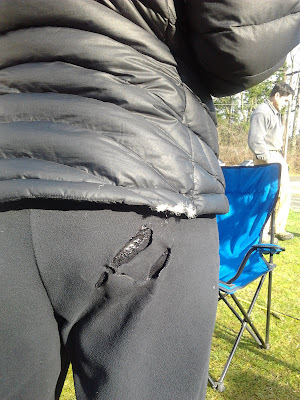 Sara Malcom gets too close to the propane heater! Prior to race day, I sent out an e-mail to all entrants that this would be the last time I was going to direct this race but keep my December run. Thanks to all who said that they will miss me at the helm. I am planning on picking a successor who will keep the run low key and grassroots-miminal aid, minimal costs, minimal whining. I will make this decision soon (hopefully in the next month). Whoever takes over will have roughly 10 months to grow pigtails. Just a few glitches as usual before race day. The night before the race, I was driving home on Petrovitsky, the main drag around the lake, when I was turned around by firefighters, who had their truck blocking the road. I had noticed that two stoplights were out as well as the homes along a 3 mile stretch. I didn't know what was going on but had to take a long detour, which added 30 minutes to my commute home and shortened the time I needed to do last minute stuff for the race. I later found out that due to all the rain that we had been getting and quite a bit that Friday before the race, the ground was very soft and trees fell on some power lines and into the road. After making a couple chocolate chip pumpkin bread loaves for post race (which were a big hit), Ken and I headed out to the part of the road that was closed (it had re-opened), and scoped out the trail in that area in the dark. The trail was clear, but the ground was quite soft and wet, making me think that slower times were to be expected for the race. We awoke the next morning, after a fitful sleep, at least for me, and headed to the start/finish area by 5:30am. I expected a handful of early startes at 6:30 with a regular start at 7:30. Ken and I were able to set up in dry conditions, something I have not done in many years since putting on this race. In fact, we almost did not need our headlamps since there was decent moonlight. I sent off the early starters in the dark and continued checking runners in. I said on my website that there would be no day of race sign up, but there are always a half a dozen and I just can't turn them away. Sara Malcom came to help with check in and stayed until her friend finished the 50K. She was a huge help, just like last year. Pablo Cabrera helped out after running one loop. And Delores Sentinella helped out until her hubby Terry finished as well. I could not have been able to record the loops splits or finishing times without their help, especially when runners came through in packs. They kept the aid station food re-stocked while I handed out cups of soup. My husband got all the donated food organized in boxes and delivered them to the food bank that morning. I also was able to give them a check for $400. That's $800 from my two races. Thanks for your generosity, especially this time of the year, which is the hardest for those in need! We really lucked out with the weather! It didn't rain all day and the sun even peeked through. This is the best weather I've had for both of my races ever. It might have contributed to all the PRs and a few course records, despite my comment that I expected low times. Or was it my comment that motivated people to prove me wrong? I pointed out Cormac Burke, who was celebrating his 50th birthday with a 50K. Jill Hudson was also celebrating her birthday, but kept this to herself until the end. At the end of the first loop, it looked like a tight race between Michael Lynes (50K course record holder) and John Collins (2 loop course record holder). They came in at the same time at 1:04. John headed out immediately while Michael made a pit stop. A minute later, 15-year-old 2 looper Brennan Wallin arrived. He didn't stay long. The first 3 women through were Kathleen Egan, Mary Hanna, and Kelly French. Kathleen and Mary were in the 50K race and Kelly was in it for 2 loops. Mary had her dog Emily, too. SuperMasters runners Scott Serpa (54) and Ronda Boyd (50) came in first for the 1 loopers in times of 1:12:20 and 1:23:08, respectively. In fact, Masters Runners dominated most of the top spots for all distances. No course records in that distance. Once again, John and Michael arrived first at the end of the second loop, Michael a minute ahead with a time of 2:10. That pit stop at the end of the first loop added a couple minutes, so his splits were pretty identical. They were on record pace. Brennan Wallin finished first in the 2 loop race with a time of 2:20:19, an improvement of 12 minutes from his last year time. This kid has a future. Kelly French set a new female masters record with her time of 2:45:38. Way to go! The one and two loopers were enjoying post race soup (chicken noodle or butternut squash) when Michael completed his 3rd loop in 3:13. That was a 1:03 third loop! His fastest loop! There was no question now that he was going to break the course record, but by how much? His previous record was 3:32:13. He came sprinting in at 3:28:27! Don't you just hate those speedsters? Except he's so nice, it's hard to do. Once again, he donated back the course record prize money of $31 to the food bank. John arrived in a very respectable 2nd place and a new open CR of 3:42:35. First woman was Kathleen Egan, who never relinquished her lead from the start. She finished 4:25:55, just over 7 minutes off the course record. Mary Hanna and her dog Emily took first female masters (Mary, not Emily) in 4:39:29, a PR for her and only 10 minutes off the masters CR. Kathleen "chicked" all but 5 male runners and Emily "bitched" two other male dogs. The 50K runners won a beanie from my December race, which has been a coveted item. It was nice seeing a good number of people wearing them on race day. It was also nice to see some great veteran ultrarunners out there. Jim Kerby, who finished in 4:10:54, 4th overall, showed that he still has some speed, despite having to back off from his previous elite years because of knee issues. He said that he has run this loop in 58 minutes. Michael also commented that he had run the loop minus the out and back in 55 minutes. Wrap your head around those times. My course record holder for one loop is 1:02. Other notables that I felt privileged to have come to my race were Mark Hartinger, Glenn Tachiyama, Scott Krell, Tim Stroh, Bill Greaves, Dave Dutton, Jamshid Khajavi, Steve Peterson, John Bandur, and Kendall Kreft. These guys were running ultras well before it became fashionable. Sorry, guys, don't mean to date you or if I missed anyone. You know who you are. There were many PRs in the 50K! Congrats to Jenny Appel, Julia Conway, Jennie Eyring, Andy Fritz, Reed Glesne, Susan Glesne, Matt Hagen, Mary Hanna, Ron Horton, Ashley Kuhlmann, Daniel Kuhlmann, Micheal Lynes, Leslie Miller, Kristin Ohm-Pedersen, Susie Ro, Bob Satko (despite rolling ankle at mile 11 and PRing by 30 minutes), Terry Sentinella, Steve Walters, and Cheryl Carrier. There might have been more but these are the runners who informed me. First 50kers were Mark Casey, Steve White, Eric Wildt, and Darol Tuttle. Daniel Kuhlmann reached Three Stars Gold Level in the Marathon Maniacs. Many finished the 2 loops for a hard earned half marathon credit. I had quite a few people say that three loops were good enough but I made them all go back out and finish the out and back to get credit for the 50K. No credit for 3 loops. Everyone returned back safe. It was still clear when I left. I was able to clean out my car at home before it got dark and rested up for a nice jaunt at Tiger Mt. the next day with Eric Barnes and Steve Stoyles. We also had a beautiful day scampering around for 3:30+ hours. I've been going non-stop since the race with home renovations, medical conference, and work, making long 16 hour days. I'll be able to relax when the home stuff is done and focus on running again. I had better if I want to actually enjoy the busy running schedule I have planned for the year with hopefully 30 ultras, including about five 100 milers. By the way, several of you asked what I meant by my comment of having run farther than any of you. If you've run 150 miles in one go, then I stand corrected. Actually Van set me on fire because I wasn't working fast enough!! Let my singed pants be a lesson to all volunteers! :) Great race, as usual, Van! Is that the hooded version of the patty down sweater in xs you are sporting in this picture?